Now that we are in the middle of Summer, my garden is full of blooms, but that doesn’t mean every flower is taken care of the same way. In order to thrive, my Dwarf Elephant Ears need to be watered much more than any other plant, my Peonies need to be tied to stakes, and my Roses need to be deadheaded. Without this differentiation in care, my garden would be looking pretty sad right now. It just proves that even if things are similar, like flowers, focusing on their differences can lead to success. New to Constant Contact? Try it free for 60 days. Similar to the garden example, your plans should vary depending on your type of nonprofit organization. If you work at a nonprofit, you know that your marketing strategy needs to be different than other for-profit businesses. This is also true for your email campaign strategy, and even your email designs. As a nonprofit, your main source of income is going to be from donations and fundraising. Email is a great way to make this ask to your supporters. Not only can you explain your mission and show pictures of how your organization helps make the world a better place, you can also make it easy for supporters to donate right from their inbox. Funding is important, but what keeps your organization going from one day to the next? Many times, it’s volunteers. Volunteer recruitment is a vital type of outreach for many nonprofits. You can market to past volunteers and volunteer prospects from your subscriber list, using pictures of volunteers to encourage people to pull up their sleeves and get involved. Sending a monthly email newsletter is an excellent way to keep the lines of communication open between you and your supporters and subscribers. It will also help keep you top of mind in case your supporters feel the urge to make a donation or volunteer. 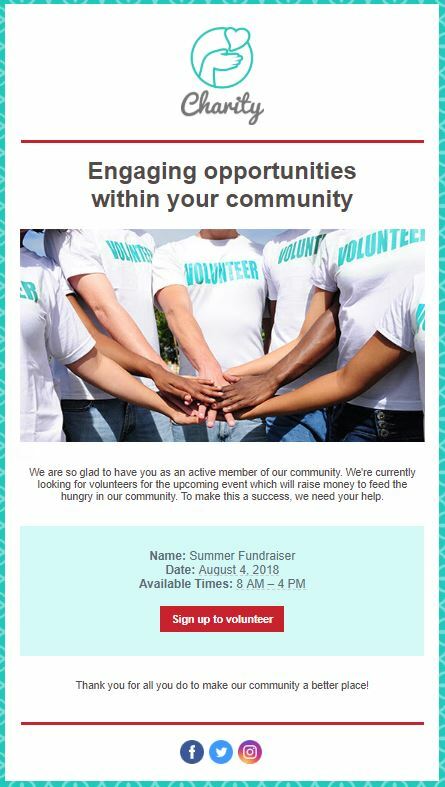 You could include upcoming events, recent pictures showing what you’ve been working on, follow up information on any campaigns that raised money, or you could highlight someone who has been directly impacted by your organization. Most importantly, include the options to donate and volunteer in your newsletter. 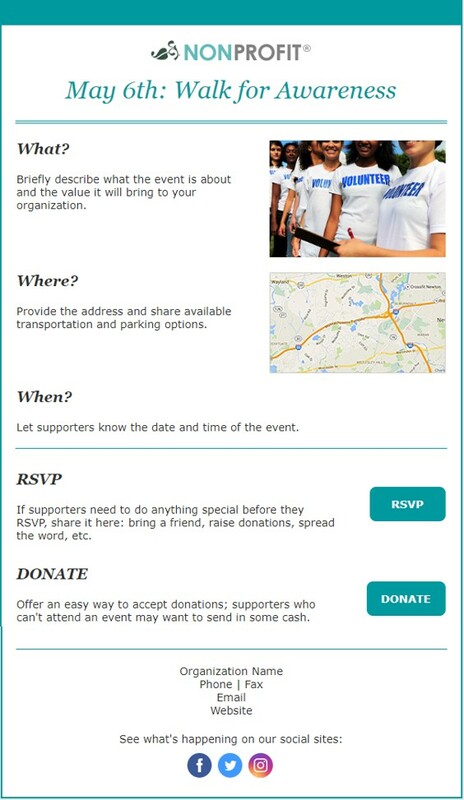 As a nonprofit organization, there is a good chance you’ll be throwing a fundraising event at some point. Email is a great way to promote these events, and is easier than communicating via snail mail. Not only can you share logistical information about the event, but you can also promote volunteer and sponsorship opportunities. For your nonprofit email marketing strategy, a ’thank you email’ is the most important message to send. Sending a follow-up email thanking your supporters immediately after they donate or volunteer is crucial, and you can accomplish that with email marketing. Make sure you include how their specific donation, money, or time, directly helped your cause. Include pictures if you can. The more you recognize and show your supporters that they are appreciated, the more likely they are to donate again. 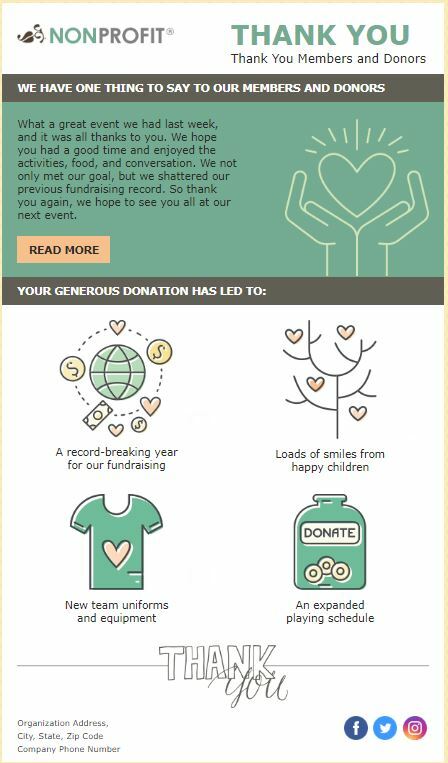 By using these types of emails that are specialized for nonprofits, your fundraising and business goals will be blooming in no time. 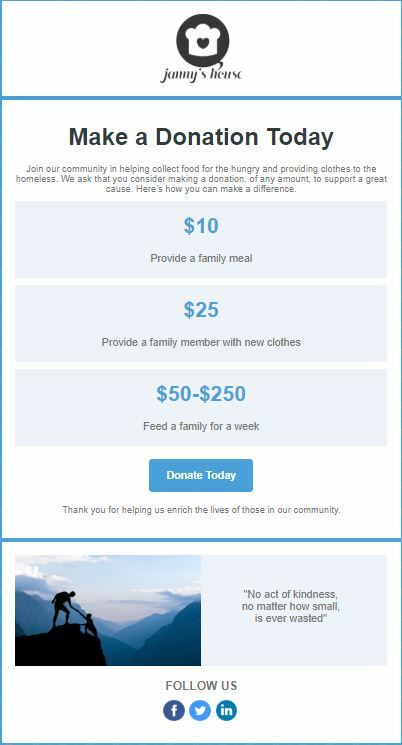 These email templates for nonprofits are waiting in your Constant Contact account for you to login and start designing!